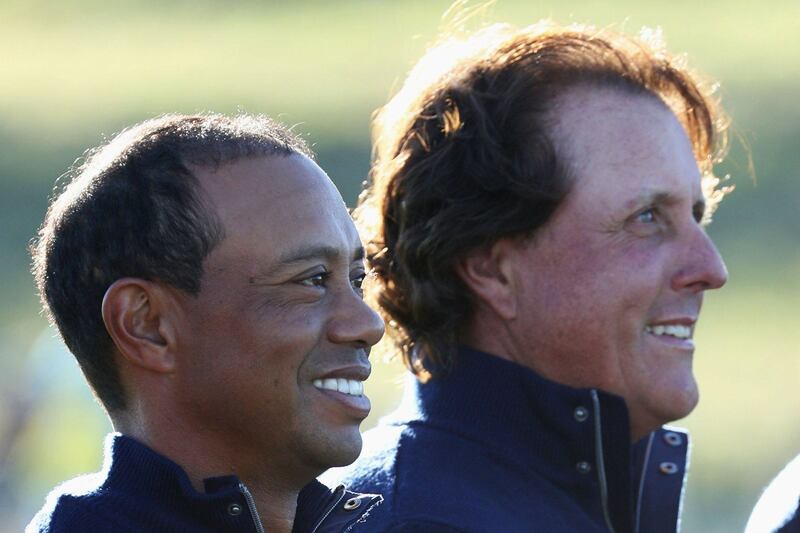 Tiger Woods and Phil Mickelson tee off golf’s first pay per view event in roughly a month and a half, with $9 million on the line in the winner-takes-all showdown at Shadow Creek Golf Course in Las Vegas. Bettors have been placing their bets ever since the match was first floated at The Players Championship back in May. Few details have been released regarding the November 23 spectacle, but multiple sources tell the Las Vegas Review-Journal this week that tickets will not be available to the general public. According to the media outlet, only a small number of patrons will be permitted at Shadow Creek, and the tickets will be reserved for sponsors of the event and certain VIPs. MGM Resorts owns the prestigious Shadow Creek, which is about 10 miles north of the Las Vegas Strip. The RJ adds that the event will not take place under the lights as Mickelson previously hinted. But with Nevada three hours behind, the PPV broadcast could air as late as 8 pm on the east coast. Las Vegas odds on the Tiger vs. Phil event opened with Woods only a slight favorite at -120. But after a run of strong play by the 14-time major winner capped off with a victory at The Tour Championship, and bettors flocked to the favorite. Woods’ line has since moved to -220 at the Westgate SuperBook. That implies winning odds of 68.75 percent, with a $100 wager netting just $45.45. Mickelson is the underdog at +180, with the same bet returning $180 should Lefty be the victor. Eighteen holes of match play will be the format, but there will be side games such as longest drive and closest to the pin. Fans who pay for the PPV event will hope to see a bit better play out of the two than what was witnessed at the recent Ryder Cup. Mickelson and Woods were both captain’s picks, but combined went 0-6. Mickelson said after USA’s defeat to the Europeans that the Le Golf National course was set up too difficult. “I’m 48. I’m not going to play tournaments with rough like that anymore. It’s a waste of my time,” Mickelson declared. “I’m going to play courses that are playable and that I can play aggressive, attacking, make a lot of birdies, style of golf I like to play,” Lefty added. Shadow Creek should be just that. The SuperBook has numerous futures props on Woods. Along with him now being the favorite for the 2019 Masters at 9/1, the sportsbook asks bettors whether he’ll win major No. 15 in 2019 (Yes +225, No -275). The odds imply there’s a 31 percent chance Tiger will win at least one of the four championships. For the most patient of bettors, odds are also available on the number of total majors Woods will have at the end of the 2025 season. 14.5 or under is the favorite at -150. And despite a contentious Team USA Ryder Cup where players criticized one another following the loss, the SuperBook feels the Americans will win the international competition outright in 2020 on home soil (US -150, Europe +130).